Yu Honglei’s art delimits an arena in which trust can be established. He attempts to infuse his sculptural language with his connection to the viewer. 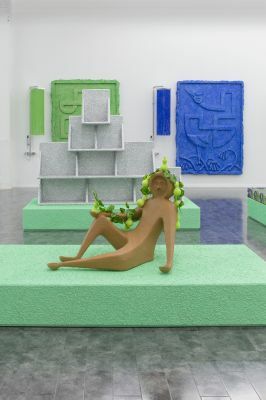 Then, through his control of sculptural language, he issues to his audience a tender command to look–directing their vision and movement, and even joining them in defining the object that is beheld. The sculptures themselves, however, remain in silent, almost classical repose. Only the most essential visual elements are ultimately preserved and displayed, the result of layers upon layers of evolution and refinement that leaves them full of static energy, brimming with their own historical and archival value. Yu Honglei (b. 1984, Inner Mongolia Province, lives and works in Beijing) has had several major solo exhibitions, including “Yu Honglei: Swallow Century” (Antenna Space, Shanghai, 2016); “Yu Honglei Solo Exhibition: Fat Mouse” (Antenna Space, Shanghai, 2014); “Yu Honglei: Everything Is Extremely Important: There is Nothing That Will Not Come Back Again” (Magician Space, Beijing, 2013); “Before I Come Close to You: Yu Honglei Solo Exhibition” (C-Space+Local, Beijing, 2011). He has participated in group exhibitions including “The System of Objects” (Minsheng Art Museum, Shanghai, 2015); and “The 8 of Paths: Art in Beijing” (Uferhallen, Berlin, 2014). Initiated in 2015, the “New Directions” series offers some of China’s most promising young artists a platform to realize their first institutional solo exhibition and monographic publication. Deepening UCCA’s ongoing commitment to emerging practices pioneered by shows including “The New Normal” (2017), “ON|OFF” (2013), “Breaking Forecast” (2009), and the “Curated By…” series (2010-2012), New Directions aims to present, through a constellation of singular positions, an overall sense of the richness and complexity of new art in China today.